The longer-than-usual break would be to allow for renovation work to be carried out in Leinster House. 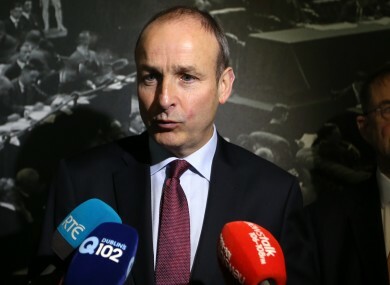 FIANNA FÁIL LEADER Micheál Martin has criticised a proposal to extend TDs’ summer holidays to allow for renovation works at Leinster House. Fine Gael’s parliamentary party was told last night that the Dáil will rise on 7 July and will not sit again until around three months later. This would be to allow repair work on the building. Speaking to reporters this evening, Martin said he was “surprised” to hear about the plan as he had been informed the Dáil would sit until 18 July. The Fianna Fáil leader said he had been told that there are “structural problems” in the old part of Leinster House that require “urgent remedial work”. However, he said there should be further discussion between the various parties in the Dáil. “I think it’s too early and it’s too long,” he said. - With reporting by Christina Finn. Email “'It’s too early and it’s too long': TDs set to take three months' holidays ”. Feedback on “'It’s too early and it’s too long': TDs set to take three months' holidays ”.